You probably already know how important surveillance cameras are for your home or business. Many crimes have been stopped and cases have been solved because of security cameras, and they are a great addition to any security system. Although you should not give up on the usefulness of a good burglar alarm and other security measures, incorporating several security cameras into your security system can make a world of difference. Not only will you be able to monitor different areas of your home or business from one room, but you will have video evidence in the unfortunate case that someone robs your home or business or commits another type of crime. Just as other technology has changed over the years, surveillance camera technology has also improved drastically in the last several years. Gone are the days of grainy and scratchy black-and-white videos and huge, bulky cameras. Nowadays, you can see everything in a beautiful, full-color picture, and you can watch your surveillance footage on a large, flat-screen monitor. Cameras have also improved over the years, and many of them are so tiny that they can be hidden. Even larger cameras have more capabilities, and many of them are waterproof, weather resistant and vandal-proof. This allows you to use the same cameras in tons of situations, and they can last for many years if you take good care of them. Along with this technology, even more technology has emerged in the surveillance camera industry. Since many people are highly dependent on their smartphones, surveillance camera manufacturers have made it possible for people to use their smartphone in order to keep an eye on their home or business. With this technology, you can watch your surveillance footage even when you are away from your home or business; there are tons of reasons why this is helpful. Many people are confused about the notion of connecting their security cameras to their smartphone. If you are concerned that you will no longer be able to monitor your surveillance footage from your regular monitor, you actually have nothing to worry about. Nothing has to change if you don’t want it to, and you only have to watch your surveillance footage on your cell phone when you want to. Otherwise, you can still continue to use your surveillance system as you normally would. Purchasing a digital video recorder that offers smartphone capabilities also does not mean that you have to give up your other favorite features. In fact, a new DVR that has this type of technology might even have more features than your existing system. Simply remember to do your research in order to make the best purchase when buying a new DVR, and do not forget about other important features simply because you are looking for a system that will connect to your smartphone. Owning a business can be stressful. Many business owners have a difficult time leaving their business, and they are often preoccupied and concerned when they are at home. Not only do you have to keep an eye on your employees to make sure that they are doing their job and that they are not stealing stock or money from you, but you also have to worry about shoplifting and other crimes. Many business owners also worry about the safety of their employees, especially late at night or in areas that are not known to be safe. Even if you are worried about your business, you do not have to stay there all of the time in order to keep an eye on what is going on. Instead, you can connect your security cameras to your smartphone. This will allow you to relax peacefully at home while still keeping an eye on your business. Your family will thank you, and you will finally be able to relax and enjoy family time without having to worry about your employees, customers or about potential thieves and other criminals. Any time that you worry about the condition of your business or about the activities of your employees, you can pick up your smartphone and tune in to your footage, even during the middle of the night. Business owners do not have the same freedom of traveling for work or pleasure as those who work for others do. Instead of simply asking for time off and arranging your trip, you have to worry about your business while you are away. Many business owners actually avoid taking trips because they are afraid of what they will happen while they are away. Employees are notorious for slacking off when they know that their boss is out of town, and you might have to worry about employees dipping their hands in your cash register or taking some of your stock or supplies. However, you can monitor all of this activity if you connect your security camera to your smartphone. Some people also worry about their business being robbed or vandalized while they are away. Although there is always the possibility that a crime could occur, you will feel better if you have the ability to tune in to your surveillance footage any time that you want. Going on vacation can be a lot of fun, but many people are anxious about leaving their home unattended for a long period of time. There are some protective measures that you can take, however. First of all, make sure that you ask a neighbor or friend to pick up your mail and your newspapers while you are away, and consider leaving a few lights and a television on so that potential burglars will think that someone is home. Setting a burglar alarm is also a great idea, and make sure that all of your windows and doors are securely locked. Also, remember to never make it public information that you will be away from home. Telling people in line at the grocery store or posting this information on your Facebook page can have horrible results, so wait to brag about your vacation until you get back in town. Otherwise, those who know that you are away might think that they have found the perfect opportunity to rob your home. You will feel better after taking these precautions, but monitoring your home with a surveillance system will help even more. If you are not home to watch your surveillance footage, you might spend your trip worrying about what is going on, but watching the footage from your smartphone makes it easy for you to monitor your home while you are away. Not only will this give you peace of mind when you are a bit concerned about your home, but it can also alert you if something is amiss. This footage will also allow you to keep an eye on the person you have asked to check your mail or watch your pet while you are away. By connecting your security cameras to your smartphone, you can keep an eye on your home from across the country or across the world. 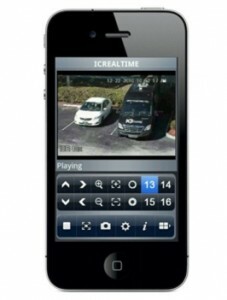 If you have decided to connect your surveillance cameras to your smartphone, you have made a smart decision. However, you might be wondering how to upgrade your current system so that you can utilize this technology, or you might be looking to purchase a new security camera system and are unsure of what to buy. In order to connect your security cameras to your smartphone, you will have to purchase a new digital video recorder (DVR) that offers this feature. In many cases, you can keep your existing security cameras, but you will have to replace your existing DVR. Regardless of if you need a four-channel DVR or a DVR that can handle many more channels, you should not have a problem finding what you are looking for; this feature is becoming increasingly popular. When you are looking for a DVR that offers smartphone capabilities, don’t be afraid to ask someone from the security camera store what type of DVR they suggest. Make sure that the system that you are looking at is compatible with the type of smartphone that you have, and you might want to purchase one that is compatible with several popular smartphones in case you decide you replace your phone in the near future. Make sure that you do not get so caught up in the smartphone capability of a DVR that you do not look at the other features, however. Just as when buying any digital video recorder, you will want to make sure that it has all of the features that you need. The number of cameras that your digital video recorder can be hooked to is very important, and now might be the time to upgrade your system by purchasing a DVR that can handle more security cameras than your existing model. There is really no reason not to connect your surveillance system to your security cameras, and there are plenty of benefits of doing so. If you are looking for one of the newest and greatest ways to keep an eye on your home or business, you should consider hooking your surveillance system up to your smartphone today. If you do not have a surveillance system in place already, this is the perfect opportunity to do so. You might think that you will have to spend a fortune in order to purchase security cameras and a digital video recorder with these capabilities, but you can often find affordable models that work extremely well. It is also worth the cost in order to protect your home or business. Visit Techpro Security today to find out more.